Cobblers boss Rob Page is confident his players will rise to the occasion when they march into the home of Sky Bet League One leaders Scunthorpe United on Saturday (ko 3pm). Promoted as league two champions in May, the Cobblers face the biggest test of their short league one life to date this weekend when they travel to Glanford Park. Scunthorpe have enjoyed an outstanding start to the season and are three points clear at the top of the table. They are unbeaten at home this season and are going to provide a stern test for Rob Page’s team, who themselves have started the campaign well and sit fifth. 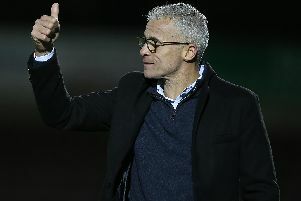 It is going to be a stern test of this Town team’s league one credentials, but Page is expecting his team to be up to the challenge. “I think our players have proven on big occasions, playing MK Dons on the television, the Manchester United game to some degree, I think they have proven that in the big games the boys step up to the plate,” said the Cobblers boss. “I have enough experience in that dressing room, with big Revs (Alex Revell) and Matty Taylor and Lewin (Nyatanga), who has experience of the Championship as well, there is enough experience in there to manage games like this and see them through. The Cobblers go into the game off the back of two defeats. Tuesday’s 3-1 loss at Coventry City in the Checkatrade Trophy can be written off as Town made nine changes, but there were concerning signs in the second half of last weekend’s 3-2 Sixfields defeat to Bristol Rovers. Page felt the defeat against an impressive Gas side was very much self-inflicted, and he is demanding the players up their game at Scunthorpe. “We need to eradicate silly, individual mistakes as the defeat was our own doing last Saturday, and that is the message I keep telling the players,” said the Town manager. “Whether that’s a set-piece where we get done from a straight header, which we did against Bristol Rovers. “Gaby (Zakuani) gets sent off and we don’t organise as a team while we are out there. “For the third goal, the first corner comes in and we deal with it, but then we don’t deal with the second phase, we switch off, and in that 10 seconds we switch off, the ball is the back of our net.